We are Manufacturer & Exporters of Carbon API 5L X52 Seamless Pipe, API 5L X52 LSAW Pipe, Carbon API 5L X52 PSL1 ERW Pipe, Carbon Steel API 5L PSL2 Welded Pipe Supplier in India. 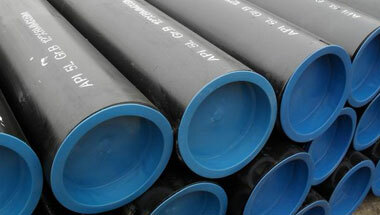 We Neon Alloys are International professional manufacturer & exporter of API 5L X 52 PSL 1 Pipe, premier exporter of bulk API 5L X 52 PSL 1/ PSL 2 Line Pipe worldwide. The quality level of all Steel Tubes API 5L X 52 PSL 1 Pipe is guaranteed by a complete internal Quality plan and certificating under ISO-9001, TUV (according to AD 2000-Merkblatt W0/TRD100), API, PED (accordance with Pressure Equipment Directive 97/23/EC), Burst test (Det Norske Veritas), and certainly Lloyds and Stoomwezen. Our Carbon Steel API 5L X 52 PSL 1/ PSL 2 Line Pipes is available in different sizes, specification & thickness as per the clients’ customized requirements. We supply all kind of API 5L X 52 PSL 1/ PSL 2 Pipe for your projects within timeline to anywhere in the world, We always try our best to help our customers with the best products and service on the market. API 5L X52 Line Pipe, API 5L X52 Seamless Pipe, Carbon API 5L X52 PSL1 Welded Pipe, API 5L X52 ERW Line Pipe, API 5L X52 PSL 2 LSAW Line Pipe Manufacturer in India. Chine, UAE, Jordan, Canada, Azerbaijan, Uganda, Algeria, Morocco, United States, Ghana, Democratic Republic of the Congo, Cameroon, Turkey, Iraq, Bahrain, New Zealand, Mexico, Indonesia, Africa, Australia, Kuwait, Argentina, Iran, Angola, UK, Kazakhstan, Dubai, Italy, London, Sudan, Saudi Arabia, Israel, Germany, Ethiopa, Colombia, Egypt, Mozambique, Brazil, Houston, Trinidad and Tobago, Venezuela, Thailand (Bangkok), Peru, Russia, Nigeria, South Africa, Vietnam, Sri Lanka, Malaysia, Tunisia. Algiers, Subra al-Haymah, Addis Ababa, Dammam, Ibadan, Dar es Salaam, Cape Town, Harare, Maiduguri, Zaria, Istanbul, Mogadishu, Tehran, Bethlehem, Yaoundé, Pretoria, Hong Kong, Freetown, Johannesburg, Dubai, Lusaka, Ouagadougou, Tripoli, Omdurman, Doha, Amman, Dakar, Cairo, Mbuji-Mayi, Kampala, Byblos, Durban, Soweto, Mecca, Jerusalem, Jeddah, New York, Muscat, Benin, Accra, Sharm el-Sheikh, Antananarivo, Abu Dhabi, Abidjan, Cairo, Rabat, Aqaba, Kaduna, Lubumbashi, Douala, Colombo, Kano, Kinshasa, Giza, Luanda, Bulawayo, Manama, Fez, Khartoum, Port Harcourt, Beirut, Lagos, Conakry, Port Elizabeth, Tel Aviv, Data from the UN, Nairobi, Kolwezi, Singapore, Riyadh, Maputo, Brazzaville, Alexandria, Bamako, Casablanca.